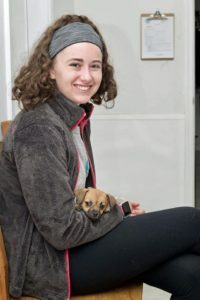 Through her company, Ziggy’s Biscuits, Zoe Fontecchio ’15 is making an impact on the lives of animals in need of rescue and care in Chester County. Zoe bakes homemade dog biscuits, and makes adorable, personalized scarves for pets, then sells them at a variety of venues and through her website, www.ziggysbiscuits.com. Zoe has already raised thousands of dollars for a variety of local shelters and rescues. Quaker Leadership Team members Paige, Auden, William, Kiran, Maddox and Isaac, with Mayor Diane Herrin and T. Amy. On Tuesday, September 11th, Quaker Leadership Team members from the Class of 2018 presented their proposal to ban single-use plastic bags in the borough to the Public Works Committee. 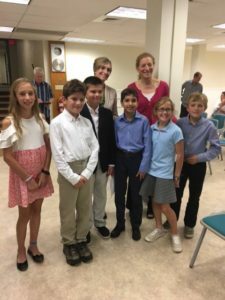 Their thoughtful, summer-long preparation included meetings with Mayor Herrin, surveys of borough merchants and shoppers, lots of research and the creation of an informative power point. The excellent outcome: the council said “yes” to their proposal and a next step of a working session with Borough Council. And at that Tuesday, September 18th work session, the Borough Council indeed asked its solicitor to draft an ordinance to forbid the distribution of single use plastic bags in stores and shops. We are very proud of our students, the careful, thorough research and planning they did with the guidance of their adviser, Teacher Amy Domenick, and the leadership they have shown in our school and our community. As caring, young alumni, they are already leading lives of impact!